... the implementation fell a little short. This is the story of Jordan Webb and his wife-to-be, Kristen Onkka. In discussing their upcoming nuptials, they - as many couples facing marriage do these days - talked about their options and their preferences. Would she take his surname? Would he take hers? Would they do a hyphenated combination name? In the course of that discussion, they noted that both of their surnames came to them from their respective fathers. Father from whom they were estranged, and of whom they had memories they would rather not remember. 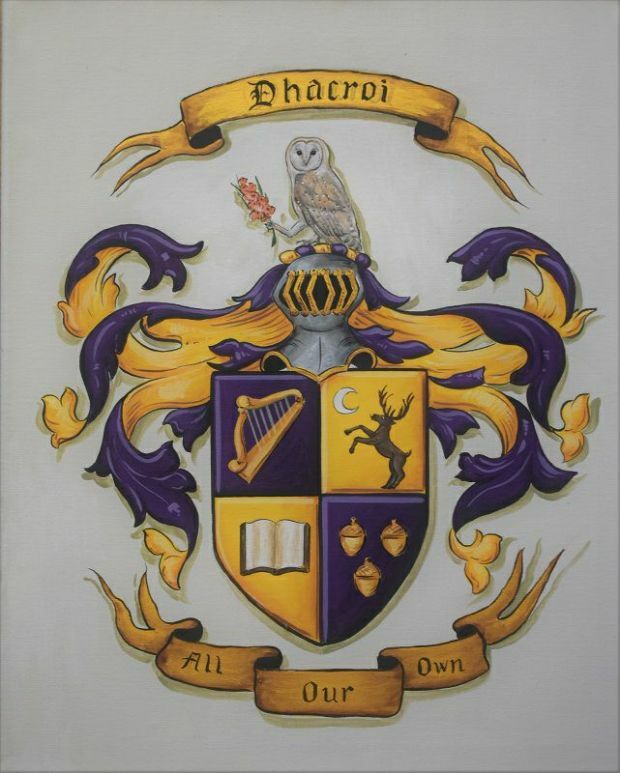 So they decided to create a new surname for their new family, and came up with Dhacroi, an Irish-Gaelic combination of "two" and "hearts". However, and this is where it goes awry, having created a new surname, they thought, "why not dive in and make a family coat-of-arms?" I mean, he's an avid reader of fantasy novels, many of which have noble houses with their own coats of arms, and what an author of a fantasy novel can do in a book, he could do in real life, right? Alas, as happens so many times with people who know very little about actual heraldry, its history, its rules, and its meanings, they came up with something that I feel sure has lots of "meaning" for them, but which comes across as something I call "kitchen sink heraldry," since it seems to have been designed by including just about everything, including the proverbial "kitchen sink." I am not going to go into all of the things that I can find "wrong" about this design. Suffice it say that there are "problems" with it.